11/20/17 - Stock up for the holiday season with new Gentlemen’s Hardware Barware. Cocktail connoisseurs and whisky lovers rejoice; we’re shaking things up! Introducing Gentlemen’s Hardware Barware. A stylish collection of unique multi-functional cocktail and spirit accessories to complement any stylish home bar. Cheers! 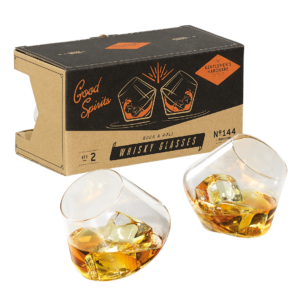 Rock and roll with this cleverly crafted set of two Gentlemen’s Hardware Rocking Whisky Glasses. An essential kit for whisky lovers everywhere, the perfectly balanced glasses are large enough for a generous serving of your chosen beverage, and can effortlessly rock and rotate, without the worry of a spill. While the specially designed rolling base encourages the spirit to breathe, releasing the full character of your tipple. A great addition to after dinner drinks, they are guaranteed to break the ice at parties! 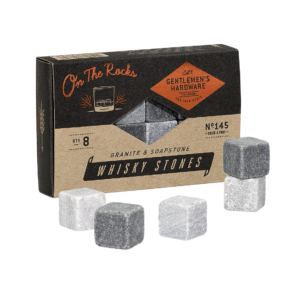 Chill your drink without dilution, the Gentlemen’s Hardware Whisky Stones are ideal for any ice-cold drink lover. Practical and stylish, the phrase ‘on the rocks’ is brought to life with this set of eight stones made from granite and soapstone. Simply pop in the freezer four hours before use, then when you wish to chill your drink, use as you would ice cubes. An innovative and unique design, ideal for travelling and any ice-cold nightcap. Perfection chilled! Give it your best shot with the Gentlemen’s Hardware Shot Paddle & Glasses. An acacia wood serving plank with a painted black handle, real leather tie for hanging and space for the four shot glasses, engraved with the quote ‘Give Your Best Shot’. Inspired by mountain bars in the Austrian Alps, where shots of home-brewed schnapps are offered around on specially shaped wooden trays, the set is a sociable way to share your much-loved tipple. The ultimate hosting accessory, crafted to provide a playful means of serving spirits and liqueurs. Cheers, Salute, Prost! Concoct your perfect cocktail with the Gentlemen’s Hardware Cocktail Shaker. 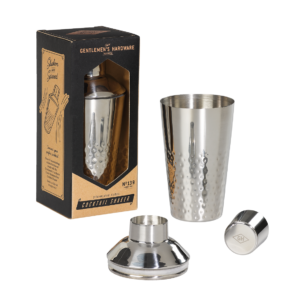 The stainless-steel shaker features a classic hammered effect design and includes a lid and strainer, complete with Gentlemen’s Hardware branding on the lid and base. Show off your mixology skills to friends and family, from martinis to margaritas, shaken or stirred, it’s up to you! An essential for any home bar or hosting night, it makes a great gift for any cocktail enthusiast. 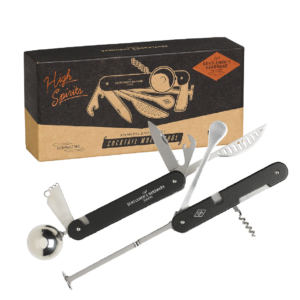 Perfect your cocktail making skills with the Gentlemen’s Hardware Cocktail Multi-Tool. Featuring a muddler, bottle opener, knife, zester, stirrer, strainer, channel knife, single measure and corkscrew, the handy tool makes a unique and stylish gift, ideal for anyone who’s ever wanted to try their hand at cocktail mastery. From mojitos to martinis, the 9-in-1 stainless steel tool is all you need to create the perfect tipple. 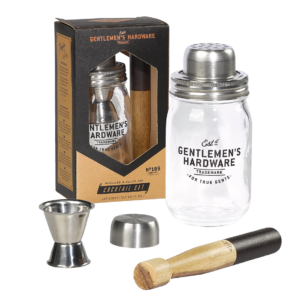 Concoct your perfect cocktail with this Muddler & Glass Jar Cocktail Set from Gentlemen’s Hardware. Complete with a branded acacia wooden muddler, the transparent glass mason jar features a metal screw lid with built-in strainer and a removable stainless-steel jigger in double and single measures with capacity markings. The branded cocktail shaker is a unique way to create your tipple of choice and makes a stylish gift for anyone who’s ever wanted to try their hand at cocktail mastery. Become an expert in the art of cocktail making with the Gentlemen’s Hardware Ice Mallet Muddler. The unique set includes a beech wood mallet muddler and branded drawstring ice bag, allowing you to effortlessly crush ice, keeping your drink of choice cool. Simply, crush hard ingredients before use to release flavours and create a much better cocktail experience. Perfect for those mojito moments and muddling seriously large summer cocktails by the jug, this invaluable bar tool makes the perfect gift for any cocktail-enthusiast.